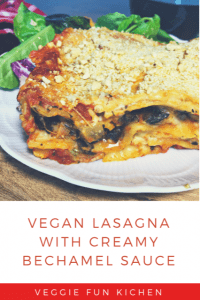 This Lasagna with Cashew Bechamel (Vegan) is comfort food at its finest! This dish is what we always cook for homecomings and special occasions in my home. 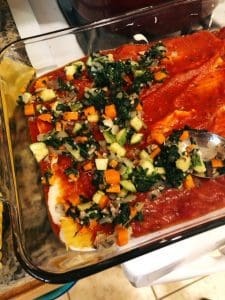 The recipe is somewhat labor intensive but well worth the effort for its flavorful, creamy, saucy, plant-based goodness. The lasagna is oil-free (depending on the sauce you use), though it does contain healthy fat with the raw cashews. 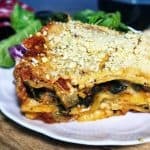 I do take a few short-cuts in the recipe with the use of jarred marinara sauce and oven ready lasagna noodles. *Affiliate links. This post will contain Amazon affiliate links. Clicking on and purchasing through these links may earn Veggie Fun Kitchen compensation at no additional cost to you. You’ve got to have a vegan parmesan cheese of some type. Either buy one, make your favorite, or you can make mine. You will want to make it while your blender is dry, otherwise, you’ll have more of a cashew/parmesan paste. Ummmm not so great. 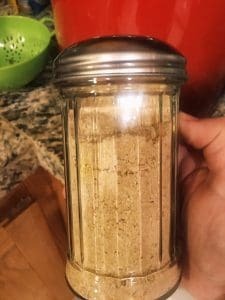 Click here for my Vegan Parmesan Cheese recipe made with cashews, nutritional yeast, and seasonings – or use one of your own. Since this recipe can be a bit labor intensive, it’s best to do it in stages. 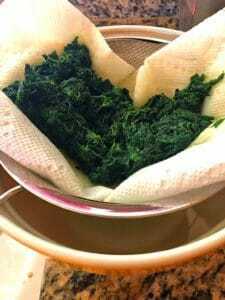 Use frozen, chopped spinach but thaw and drain it well. Thaw and drain the frozen chopped spinach. I drain over cheesecloth if I have it or a paper towel AND a colander of some sort. After a bit, change out the paper towel and press the thawed spinach into the paper towel until it is as well drained as possible. 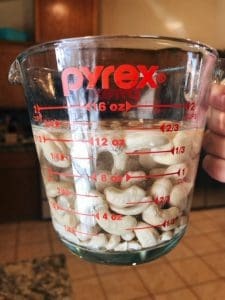 Soak your raw cashews for in water for at least 15 minutes. Drain water before using. Now get ready to chop the vegetables! 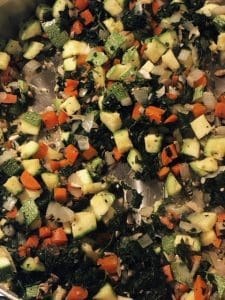 Chop all of the vegetables into very small pieces so they are ready to sauté. Keep the onion separate as you will begin to sauté that first. Just as a reminder, your thawed spinach should be draining. Line a sauté pan with a little veggie broth and add the onion. We don’t use oil to sauté in this recipe. Vegetable broth will do just fine! Sauté for about three minutes until the onion has begun to soften. Add the remainder of the chopped vegetables, including the garlic. Stir around for about 5 minutes or until the vegetables have softened. Do watch your pan though, so that the vegetable broth doesn’t dry up and the pan begin to stick. Add more vegetable broth if necessary. Add in the seasonings, and drained spinach. Stir around a bit and then set aside. 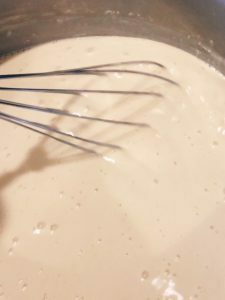 Blend the cashews, flour, plant milk, nutritional yeast, and seasonings together for the bechamel sauce. By now the cashews should have soaked enough. Make sure to drain them before putting them in the high-speed blender (affiliate link). Add in the vegetable broth, flour, white miso paste and nutritional yeast (affiliate links). 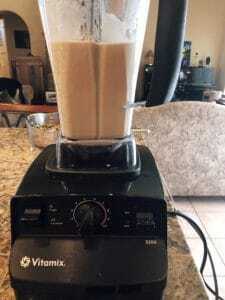 Blend on high speed for about 3 minutes or until creamy and smooth. Pour into a medium saucepan. Add in the unsweetened plant milk (I have used both plain unsweetened almond and cashew milk). Cook on medium heat till thick and bubbly. About 7-10 minutes, stirring the entire time to keep from scorching. Remove from heat and stir in the salt and nutmeg. Set aside. Stir until thickened and bubbly. This recipe uses two 24 ounce jars of Marinara Sauce. Read your labels and make sure to buy a brand that fits in with your eating ethics. It’s hard to find an oil free brand. I have a pasta sauce recipe you can make if you prefer, but you will probably need to double it. Do follow the exact order in the recipe card to layer and assemble the lasagna. 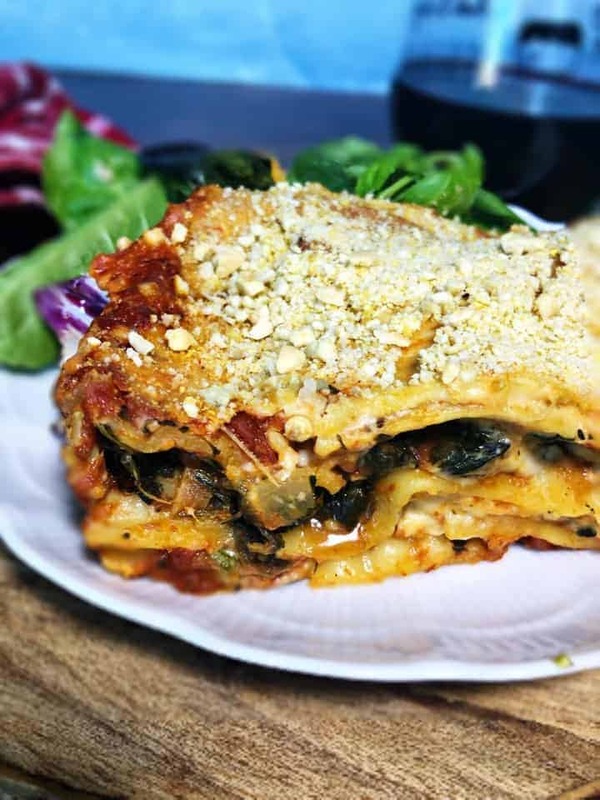 So that you don’t need to boil the noodles, this recipe also calls for oven-ready lasagna noodles. This means that you can just use the lasagna pasta strips in the recipe without boiling first. If you forget and accidentally buy the regular lasagna, only par-boil and layer them in the pan half cooked. Do follow the directions in the recipe for layering the lasagna. You will be using an 11×15″ pan to assemble and bake. I use this little oven pull to pull out the rack and add the toppings. Cook covered in 375° oven for 35 minutes, take off the foil and sprinkle with your choice of parmesan cheese OR nutritional yeast. Take the lasagna out and let sit for 20 minutes before cutting into it. Serve with a green salad and some yummy Italian bread! So good! 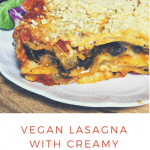 This vegan lasagna with cashew bechamel is dairy free and can be oil-free. 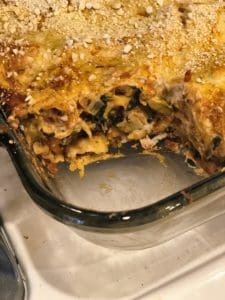 It is loaded with vegetables and flavor. The bechamel is made with raw cashews and plant milk and is so creamy and smooth. Thaw and drain frozen chopped spinach. Soak cashews in water for at least 15 minutes. Make or purchase parmesan cheese (can sub in nutritional yeast). Dice all vegetables and set aside. The onion should be kept separately as it is going to start sautéing first. Line a sauté pan with vegetable broth. Add in onion and sauté for about three minutes or until it just begins to soften. Add in all other vegetables except for the spinach. Watch your pan so that it does not stick. Add more vegetable broth if necessary. Continue sautéing till all vegetables have softened - about 3-5 minutes. Add in thawed and drained spinach, Italian seasoning, salt and pepper. Stir to combine and set aside. Drain and add the soaked raw cashews to a high-speed blender. Add in the vegetable broth, flour, white miso, and nutritional yeast. Blend on high speed for 3-5 minutes or until creamy and smooth. Pour in the cashew/broth/flour mixture into a medium saucepan. Add in unsweetened plant milk of your choice. I like either almond or cashew milk. Cook on medium/high heat, stirring constantly so that the bottom doesn't stick until thick and bubbly. Stir in nutmeg and salt. Set aside. Layer the lasagna in an 11x15" pan. 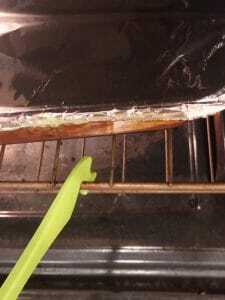 Cover with foil and cook in a 375° oven for 35 minutes. Pull it out and check to see if the lasagna noodles are tender. Put back in for 5 more minutes if necessary. Remove cover and sprinkle parmesan cheese (vegan) or nutritional yeast on top. Return to oven and let cook for 10 minutes more, uncovered. Remove from oven and let sit for about 20 minutes before cutting. Serve with a green salad and Italian bread. This recipe includes nuts (cashews). You MUST disclose this to anybody eating this recipe as lasagna typically does not contain nuts. Veggie Fun Kitchen by Cindy Rainey I love to eat...and therefore I needed to learn to cook! I am vegan and plant-based - yes there is a difference. Recipes and advice on Veggie Fun Kitchen will reflect this. I love that this is Vegan but still has 13 grams of Protein! This is a great recipe, I love turning traditional foods into a vegan version. I need to share this with my sister. She is always looking for more Vegan recipes. I just sent her the link.